According to the statistics from CoinMarketCap, as of August 2018, the market value of global cryptocurrency has evaporated nearly 75%, whereas a bear market in the cryptocurrency sector has not yet come to an end. In a turbulent market like this, token holders are most afraid of reoccurring credential issues in ICO as well as the dramatic volatility in cryptocurrency prices. In this regard, what token holders currently call for is perhaps not new cryptocurrencies, but a hedge coin in the sector. Under such backdrop, GramGold Coin Collaboration (GGCC) skipped the controversial ICO (Initial Coin Offering) and completed ICC (Initial Coin Circulation) this September. A GramGold Coin (GGC), issued by GGCC, is a hedge coin with the underlying logical 1:1 ratio of 1 gram of physical gold. Our mission of issuing GGC is to become one of the top Hedge Coin providers, so that token holder can, not only have an alternative to go for in the fluctuating crypto market, but also a measure to obtain consistent stability. GGC’s operating model is to purchase physical gold from certified provider BullionStar, save it in world-class storage facilities, coin tokens on smart contracts with the PoA. Token holders holding GGC not only have a crypto token but under the consensus in the Blockchain, in fact, own an equal value to gold. In this way, token holders are able to reach stability and balance in their crypto portfolio. GGC will be on the world’s top 10 exchanges by the end of 2018. Why is Hedging a Must for Your Business? In 2018, the two most valuable cryptocurrencies in the world, Bitcoin and Ethereum, have taken their year-to-date losses to an eye-watering 50%. Until Sep. 15, 2018, Bitcoin has dropped 52.3% while Ethereum has crashed 71.9% compared to that on Jan. 1, 2018. If token holders wish to exchange crypto to fiat, an additional transaction fee to varying degrees will be charged by exchanges. Gold’s wealth preserving ability has withstood the test of time. Its prices have a low correlation to the market’s economic activities and have sustained a relatively stable price range. Such characteristics make gold the most reliable asset when the economy is in systemic crises. In the cryptocurrency market, one that is more volatile than traditional financial markets, a secure and valuable option is needed more than ever. 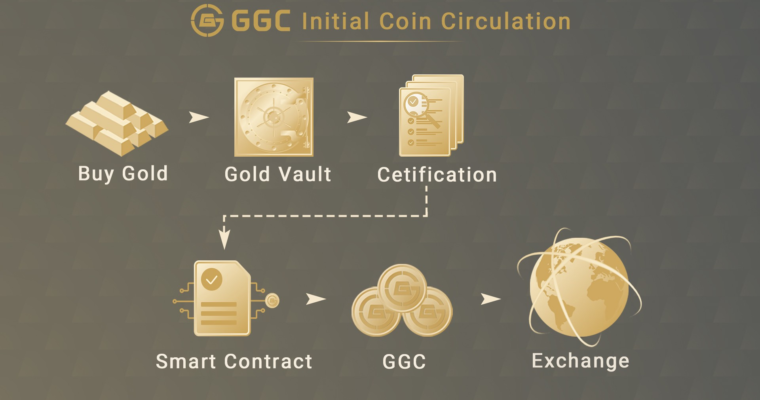 Each GGC is tokenized through a smart contract logically supported by a gram of physical gold with PoA, certified by world-class storages. With such a structure, token holders are able to enjoy stability through the Blockchain’s consensus system. The nature of gold enjoys higher flexibility in Blockchain than traditional markets. Token holders around the world can purchase such crypto asset anytime, anywhere. BullionStar works with Bureau Veritas, the world’s cutting-edge third-party auditing firm, to audit twice every year, and is 100% subscribed to world-class insurance company Chubb Insurance. Next articleIs Bitcoin Primed to Initiate a Rally Above $7,000 After Weeks of Stability?